Oak Knoll develops tomorrow’s leaders. We motivate our students to answer the "call to service." We encourage them to "step forward." Leadership positions require time and energy, but the rewards are many. Training is vital and essential to the development of strong, capable, and responsible leaders. The school provides leadership training for all elected representatives, peer leaders, publication editors, and activity presidents in May of each year. Within each activity, students receive follow-up training in September. Students meet in June and September to set goals for the school year. The deans conduct two leadership training sessions with the entire class in the spring of junior year. Outside trainers may join student leaders from the previous term to assist in the training. Underclasswomen look to the seniors at Oak Knoll for their leadership and capacity as role models. Each year in their guidance classes and outside meetings, the junior class learns more about this role as rising seniors. Much discussion about their responsibility as role models, their "call to service" as leaders, and the opportunities available for their development as leaders occurs. The school strongly encourages all juniors to answer this "call to service" and take responsibility for the leadership of an Oak Knoll student activity or run for an elected position. All students in the senior class serve as leaders. The desire for leadership is quite impressive. Providing opportunities for student leadership is a vital component in fostering the development of young women as responsible, caring adults. Students in all grades have an opportunity for leadership within the homerooms in the committees formed to work on Spirit Week, class fundraisers, class liturgies, class meetings and various grade level activities. 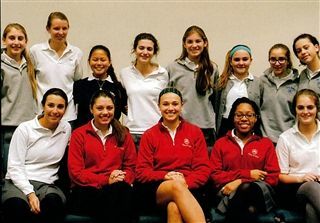 The Student Council of Oak Knoll facilitates and initiates many student-run activities. Within the framework of six council groups, many students serve at varying levels of leadership. Grade representatives belong to each council: Academic, Athletic, Campus Ministry, Creative Arts, Social and Core Council. The core council includes the class presidents, vice-presidents, council presidents of each of the five councils, as well as the student council president, secretary, peer leader coordinators and the publicity chairperson. Each of the five councils functions with a moderator and president (student leader). Two representatives from each grade serve on the Athletic, Campus Ministry, Creative Arts, and Social Councils. The vice-president of each grade serves on the Academic Council. In addition, the group of presidents for each performance activity complements the Creative Arts Council. Serving in any leadership capacity is an honor that represents a serious commitment on the part of the person elected. Students attend weekly meetings both at the class level and the council level. Each class and council plans many activities. Students must attend and participate in these meetings and activities. The Academic Council: Serves to address student concerns regarding academics, provides for student tutors and disseminates information on summer opportunities. The Athletic Council: Serves as student support for the athletic program at Oak Knoll. Vital functions of this council include serving as a student vehicle for athletic input and communicating upcoming events to the student body at large. The Campus Ministry Council: Serves to coordinate the Campus Ministry program with members of the Campus Ministry Team and to represent and organize students for all activities. Campus Ministry representatives take turns selling bagels on Tuesday and Thursday mornings to raise funds for PIN (People in Need). Council members announce and encourage participation for all activities. The Creative Arts Council: Serves to support and provide communication for all Creative Arts groups and performances. They organize the annual Upper school Talent Show and promote other arts activities throughout the year. The Social Council: Serves to provide social activities at Oak Knoll. The Junior-Senior Prom, the Annual Semi-Formal for grades 9 to 12 and the school dances are just some of its programs. The Coed K-6 Elementary School has elected its first-ever student council for the 2014-15 school year. This opportunity will not only teach the sixth graders leadership skills, but it will also help students to learn how to set goals, practice public speaking, and follow through on commitment. 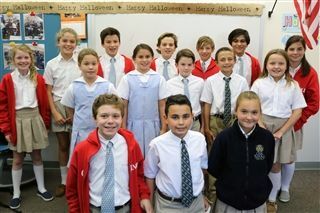 Students in grades 4-6 also have the opportunity to serve as homeroom representatives. Sixth graders are elected to an executive council consisting of president, vice president, treasurer and secretary. 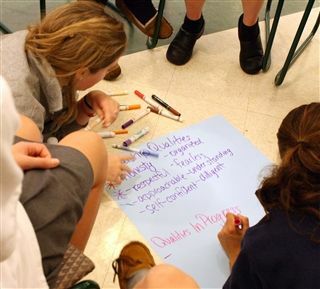 The Peer Leadership Program, comprised of seniors working with grades 5, 6, 7, 8, and 9, operates under the direction of the Upper School Dean in cooperation with Student Council. This program requires a commitment of time, energy, dedication, and a desire to support others. Seniors participating in this program are leaders who develop a special rapport with younger students. Peer Leaders attend weekly planning sessions during the year and several meetings over the summer to prepare for the school year. Sixth, seventh, eighth, and ninth graders look up to their peer leaders and emulate their behavior and attitudes. The Peer Leaders meet once every cycle with the students in grades 7, 8, and 9. Other peer leaders work with the sixth-grade students to ease their transition to the Middle and High School. The meetings include discussions about social and academic pressures; relationships with peers, parents, and faculty; and any problems or concerns that need to be addressed. In addition to the group sessions, peer leaders organize activities such as games, fun nights, parties, and luncheons.